At the film’s press day, co-stars Benicio Del Toro and Demian Bichir talked about what it was like to work with each other again (they had previously co-starred in Che), the freedom that director Oliver Stone gave them in portraying their characters, what resonated with them about the men they were playing, and their concerns with playing this type of role. Check out what they had to say after the jump. Question: You first worked together on Che. What was it like to work with each other again, in this light? BENICIO DEL TORO: He was somebody else and I was somebody else. When you do movies, I think that’s possible. 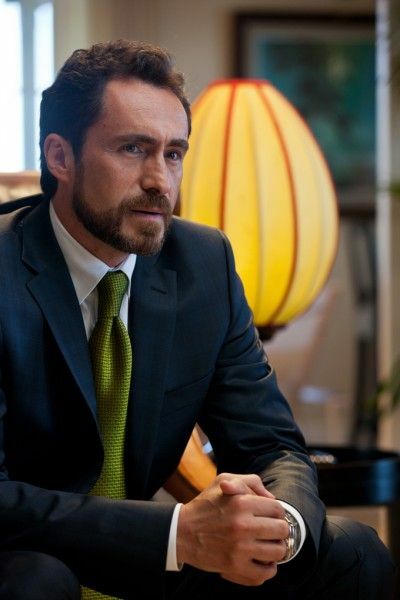 DEMIAN BICHIR: I think the result is right there on the screen. As soon as you believe what’s happening there, all the fights that we had backstage don’t really count. That’s a joke. It’s always a pleasure to play with great players. I love soccer and tennis and, when you have a great player playing against you, your game always improves. Benicio is one of the greatest actors in the world. BICHIR: And it’s always a pleasure to be on the same set with somebody like Benicio. It’s a joy. It’s a really easy ride, and you always learn a lot. DEL TORO: It really is a pleasure to work with someone who you admire. Whatever you do in front of the camera, and I don’t know what it is, but actors have this thing that you recognize someone that makes you better. When you do that, it’s a great feeling. It’s like playing a sport. It’s a lot of fun. What was it like to work with Oliver Stone? Did he give you a lot of room for improvisation? DEL TORO: The main reason for me doing this was Oliver Stone, as a filmmaker. Yeah, he allowed improvisation. He wants you to think and he wants you to make sure that you commit to it, so he might present some questions that make you think about your choices. Sometimes you have to be on your toes. I wouldn’t say he allowed total improvisation, but there was a sense of being able to be free and explore things. And then, when you’re working with actors like Demian, it makes it easier to explore things. Oliver makes sure that you’re understanding where you are, in the story. He knows the story, back and forth. It’s like a coach, in a way. What was it about each of your characters that resonated with you, and what inspired your take on your role? BICHIR: When I read the novel, I was really impressed with not only the way that (author) Don Winslow tells the story, but how accurate everything was. It’s one of those stories where you want to play any role. You want to be a part of it, in any way. So, when I first met Oliver, we talked about Alex. It was a chance for me to go into a whole different direction than what I did in A Better Life, and that’s what you want, as an actor. You sometimes have to say no to some other characters and projects because they’re so similar to what you’ve played before. But of course, if Oliver Stone calls, you say yes, and that’s that. You don’t even ask. I was lucky enough to not only be there for this project with him, but to be a part of this fabulous cast and play this role that allowed me to go in a different direction. DEL TORO: It was pretty much the same thing for me. The book and the story is fantastic. I loved the satire of it. I’ve done stuff like this, but for me, Oliver Stone, the cast and the story was what made me want to get up and work. Did either of you have any concern about playing this type of character? DEL TORO: I don’t think so. I’ve played drug dealers, all my life. I’ve made a career of killing people and playing all kinds of killers. As a Latino, you think about the portrait of the Latino, but it’s not one-handed, necessarily. There are not a lot of issues that get explored, on the other side. There is some sort of balance. It’s not blaming one person. When you blame just one group, it’s a problem. But here, in the way that I look at it, it’s a bigger issue. 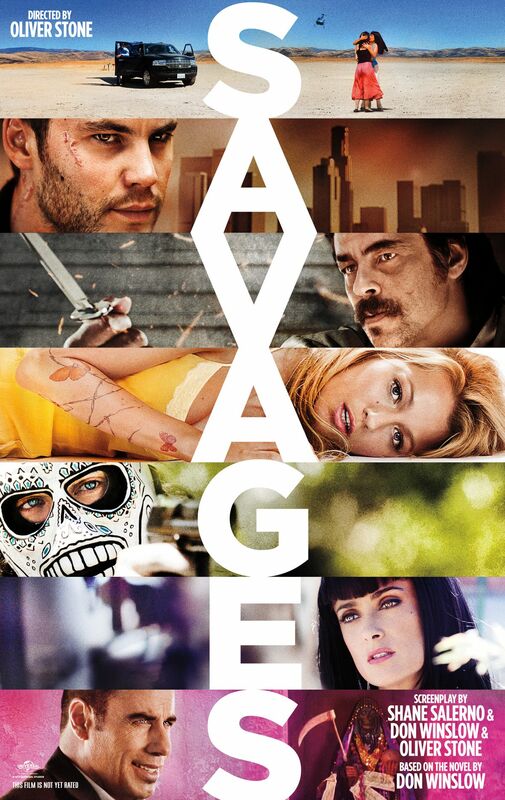 The violence and drugs is portrayed in exaggeration. This is fiction. That is how I looked at it. It’s more complex. And, sometimes truth is stranger than fiction. Just open a newspaper. BICHIR: I agree with that. A lot of people in Mexico are so concerned about the choices you make, as an actor . When they heard that I did this film for kids in Ireland where I play a pilot who’s supposed to be traveling with some emeralds, they said, “Another drug dealer!” Everyone gets really, really concerned and worried about that. It’s not about what the character does for a living, but about the project and the power of the character itself. There are so many films about trials or cops, and there are so many ways of telling the same story with the same character or occupation. It’s not about that. It’s about many other things. 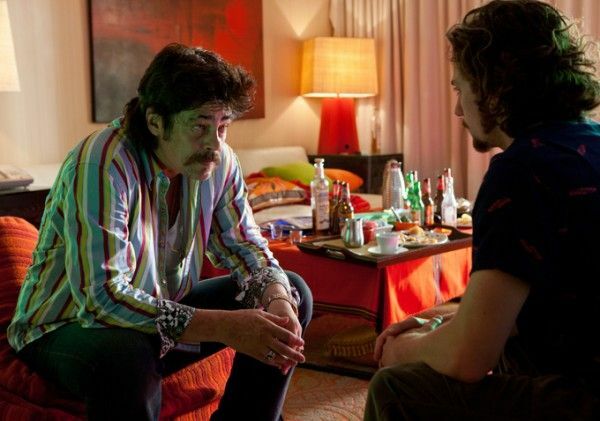 I’ve played bad guys, drug dealers and good guys, just like Benicio has. There are some projects that you say no to, when the director is not what you want or the cast is not what you dreamed of. All of that together makes the whole thing. Fortunately, for me, it’s a blessing, as an actor, to be a part of this type of project. We’re actors, and that’s what we do. DEL TORO: Elements of this happen, every day, in any place, and it’s a problem. This film deals with very strong themes and situations that Mexico is facing right now. Demian, what are your thought on everything that is going on there, at the moment, with the cartels and the presidential elections? BICHIR: It’s very interesting. Mexico is living through very crucial times now, and this film came just at the right time. The same thing with Colosio, which is another film that’s just starting to be shown in Mexico. Cinema serves as a constant reminder to us of who we are and what we are made of. We’re basically historians. We’re chronicling things that are happening now. Colosio is just arriving in cinemas now. It was 18 or 20 years ago that this happened. It’s very important for people to remember the PRI (Institutional Revolutionary Party) and PAN (Partido Acción Nacional), and to know the history of those political parties and how each of those parties have had a chance, but they haven’t been able to do anything. The only thing they’ve been able to do is make a big mess of everything that’s going on in Mexico. I’m not just talking about the vast amount of poverty and inequality that there is in Mexico, but rather cultural depravity and misery and the moral decline in Mexico. This is a key moment for this kind of thing, with such an important voice as that of Oliver Stone. Oliver Stone has really been able to put his finger on the problem. It’s not just a problem for Mexico, it’s a worldwide problem. This film could have been made in many different ways. It could be a local film, but people wouldn’t find out about it. There’s a much deeper dimension to the film. I think it’s important that you have something to counteract all of the publicity and media that Mexico is using to manipulate people and change people’s minds in spite of 132 (Mexico’s burgeoning student movement, called YoSoy132 or “I am 132”). It’s also on the side of culture and art. I do think it’s really important for people to get information. Not just what’s on television, but reliable information that’s clearer and less manipulative, and cinema can serve that purpose. Benicio, what type of conversations did you have with Oliver Stone to make sure this crazy character was grounded in reality? DEL TORO: Really, it started with the book. The book was the first thing. That became the background of the characters, for every character. The script was somewhat different than the book. I talked to Oliver with a lot of respect and tried not to drive him crazy. Demian, what was it like to shoot your torture scene? BICHIR: It was pretty exhausting. Any film exhausts you because there’s a lot of work, way before you go to the set. I remember seeing Benicio as Lado, for the first time, and I remember thinking, “What is this guy going to do with the character? How is he going to make him and dress him, and what is he going to look like?” That’s really exciting. And when I saw him the first time, it was beautiful to see how that transformation happens. Same with what Salma [Hayek] did. I think this is one of her best works, ever. And seeing John Travolta playing that guy like that, that transformation is magic and it’s exhausting. That particular day was really, really exhausting, but a great director always makes sure that everything on the table is safe and ready to go, for you to perform your best. And if you missed them, here’s our interviews with Oliver Stone, Blake Lively and Salma Hayek, Aaron Johnson and Taylor Kitsch.